I love the Gra mmy Awards! Grammy night is huge for me. It’s my Super Bowl Sunday. My mom would say that the Oscars are where it’s at, but I beg to differ. What other awards show is the equivalent to watching one big concert with some of today’s hottest artists? Definitely not the Oscars! The Grammy Awards also act as the runway to some of the biggest moments in fashion. Who could forget Jennifer Lopez’s infamous green Versace dress? You know, the one cut “down to there?” People are still talking about it! Overall, I have to say that I was really impressed with this year’s Grammy Awards. I loved that the evening was full of non-stop performances, and felt that all of the artists who performed last night offered up some great entertainment. As I was watching I tried to jot down my thoughts for you all, so here it goes:Lady GaGa & Elton John were a wonderful team! Who knew that Lady GaGa was actually musical? Don’t get me wrong, I like Lady GaGa’s music as much as the next person, it just isn’t as substantial as the music of say…Elton John? Their performance really showed that Lady GaGa has some musical chops. I love the “his and her” mash up of Speechless and Your Song. I’ve always been a sucker for Elton’s Your Song and they performed it very well. Elton really offers up some of the best Grammy performances. I still love his performance of Dear Stan with Eminem.I was semi surprised that Beyonce’s Single Ladies won as many awards as it did. I take that back, I think that I expected it to win but was holding out hope deep down that it wouldn’t somehow. The best thing about that song is the music video. When I first heard Single Ladies I really disliked everything about it. The only thing that kept me from completely washing my hands of it was the use of it on the television show Glee–BEST SHOW EVER! In the context of the show I enjoyed it. Of all of the singles that have come off of Beyonce’s latest album, Single Ladies is my least favorite. I just don’t feel that it shows off Beyonce’s vocal talent like some of her ballads such as If I Were A Boy or Halo does–the last of which happens to be my favorite and I am truly glad it won an award last night. A lot of performers out there could sing a song like Single Ladies, but few can sing ballads like Beyonce can. This brings me to Beyonce’s performance last night. She definitely made her presence known entering the room as her alter ego Sasha Fierce and escorted by an army of uniformed officers–we get it, you’re fierce. Once she started singing though, I was all ears. She can really sing. If I Were A Boy was a good choice for her performance. That song really shows off the amazing control she has over her voice. I’m still not sure how I feel about her performance of Alanis Morrissette’s You Oughta Know. I just don’t think Beyonce has enough to be angry about to sing that song. It takes a special kind of crazy to sing that song with the same passion that Alanis sings it. It is said that Alanis wrote the song after her relationship ended with Uncle Joey from the hit television show Full House. Since I am pretty sure that Beyonce was never in a bitter relationship with Bob Saget or Uncle Jessie, I just don’t think she can truly understand Alanis’ pain, and therefore, perform that song with the same intensity. I can see the connection between the two songs–the topic of fidelity–but I’m not sure that it was my favorite mash up. Pink’s performance surprised me. I was really taken aback that she chose to perform Glitter in the Air. She did a nice job with it though. She really is a powerful singer when she wants to be. She has the wonderful ability of pouring her emotion into a song, making you feel somehow connected to her like you know her personally. I was surprised by the acrobatic act and the almost non-existent body suit. Of course I was even more surprised by her turning into a human sprinkler and dousing all of the famous people in designer gowns–that probably cost more than what I make in a year–with water. All I have to say about her performance is that if she was actually singing the entire time while spinning around in the air performing crazy acrobatic stunts, I will forever be impressed! The Black Eyed Peas performed Imma Be. I’m not surprised that they chose to perform their current hit from the charts. I am just thankful that they quickly switched over to I’ve Gotta Feelin’ because that is my jam! My favorite BEP songs are the ones that make you want to hit the dance floor or run a marathon–not that I do either, I mostly sing along in my car and attract stares from strangers. Songs like Let’s Get It Started, Pump It, Hey Mama, and I’ve Gotta Feelin’ are what the BEP’s do best! 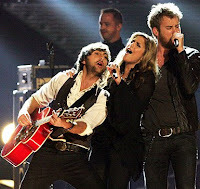 Lady Antebellum is a relatively new favorite of mine. I was excited for them to perform at the Grammy Awards. I thought they did a nice job. I Need You Now is a good song, and they performed it well. I’m always impressed when artists can perform a song as well if not better than the album recording. It is so disappointing to hear an artist sound completely different in person. Kind of like how Fergie sounded in last night’s performance, bummer. You come away feeling a little cheated and wondering just how many takes it took for them to get the song to sound the way it does on the recording. Record of the year was a tough choice. I really like all of the songs that were nominated. I was pretty excited that the Kings of Leon took it though. With a lot of awards going out to Taylor Swift and Beyonce, I was patiently waiting for someone to win in the rock genre. I like the Kings of Leon. They offer up a nice combination of classic and modern rock with lyrics that are very introspective. The best part of the Jamie Foxx performance was Slash. I’ve decided that Slash could make anyone look good. He is an AMAZING musician. He really has incredible talent. If you want to be impressed by Slash’s talents on guitar check out his song Obsession Confession, pretty impressive stuff. Taylor Swift is great. I’m really glad that she won Album of the Year and Best Country Album. After getting over my extreme jealousy brought on by her amazing success as a musician at such a young age, I bought everything out there with her name attached to it and I love it all. She’s done a great job of bridging the gap between country and pop, her music is totally feel good, and I LOVE that she actually plays an instrument and plays it well. That is so rare for most of today’s pop starlets. Well, I could keep going on and on about some of the other wins and performances, but I worry that no one will ever read my blog again and that would be sad. I need to keep what little readership I have–even if it is only mom and dad–so I’ll end it here. 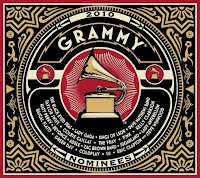 Feel free to leave any of your thoughts about the 2010 Grammy Awards. I’m already looking forward to next year’s show! « Feelin’ Like P. Diddy?